ComVerse - Committed to the integration of Internet and voice-based multimedia enhanced consumer communication applications and services. Dialogic - Voice portal solutions. 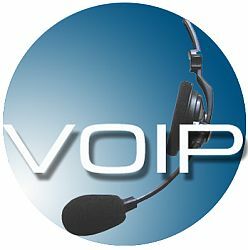 How VoIP Works - Article by Robert Valdes and Dave Roos. IBM Embedded ViaVoice - Get information or buy ViaVoice speech recognition software for Windows or Macintosh. Learn about IBM voice solutions and technology for Web, telephony, Linux and mobile applications. Provides fully integrated, automatic speech-recognition and text-to-speech capabilities for small mobile devices, including automotive telematics systems and hands-free phones. Nuance - Delivers speech recognition and voice authentication software that makes the information and services of enterprises, telecommunications networks and the Internet available from any telephone. Skype - A software application that allows users to make voice calls and chats over the Internet. Calls to other users within the Skype service are free, while calls to both traditional landline telephones and mobile phones can be made for a fee using a debit-based user account system. See Wikipedia. Spirit DSP - Voice and video over IP software. Tellme - Free service used from any phone by dialing 1-800-555-TELL (1-800-555-8355). Once connected, say one of the keywords like "restaurants", "taxi", or "stock quotes" to get the information you want. Voice over Internet Protocol (VoIP) - FCC.gov page. Voice over IP - Wikipedia article. VoIP Providers List and Directory - Find the most suitable provider for you. Browse VoIP providers by ratings or user reviews, leave feedback and communicate. For business users, trade VoIP traffic, buy and sell minutes, check up your potential partners feedback, and get connected with thousands internet telephony users worldwide. This webpage last updated on Wednesday, January 6, 2016 3:30 PM.